My name is Jackline Bonaventura Ngowi. Since January of 2014, I have been volunteering through AVC at Amka Center in Njoro, Moshi. At Amka Center, we teach children. I teach 28 kids between ages 3 years to 5 years old. I have been volunteering for about a year and I have seen the children learn and improve so much already. 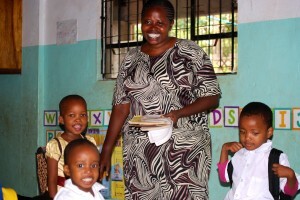 Before volunteering at Amka Center, I was teaching at a primary school. This year was my first time working with such young children, and I feel like it was a big adjustment from primary school. In the future, I hope to open my own child care center. It is because of my experience teaching at Amka Center that I feel confident that I have the skills and experience necessary to open a center for nursery aged children. This year in my classroom, I care for the children, teach them, and play and sing with them. Right now I am teaching the children how to read and write, and also to draw. I also teach them sports like football and netball, which is my favorite. I like being able to teach the kids a variety of skills because it allows them to be creative. Creativity allows them to grow their talents and to explore subjects outside of math and reading, like sports, music and art. No one asked me to be a Volunteer, but I decided I wanted to be one. I signed up to volunteer with AVC because I wanted to help my society. Sometimes it can be challenging though. Many of the newer, younger kids don’t like to practice reading and writing and they often cry all day. I have learned how to calm them down by talking with them in a low voice. I think local volunteering is good for our community. There are so many different ways that local people can help their own society, one of which is teaching. Foreign volunteers don’t always understand the culture or the language in the same way as local people, but foreign volunteers can still have a positive role if they work together with local organizations and volunteers to help them do the work they are already doing. For example, when foreign volunteers come to Amka Center, the children enjoy playing and learning with them. They bring toys, learning materials, games, and activities for the classroom. These things make teaching easier. The foreign volunteers help teach the children new games and can help them improve their English. This is exciting for the children and helps them learn. It is very special for me at the end of the year when I find out that my students have moved up from nursery school to primary school. I feel proud of the work I have done and it makes me very happy. As an AVC Volunteer, I have been able to improve my teaching skills for the future and I am teaching the younger generation to also help the community. I see that I can help my whole community by doing this and I think that is very important.